A bigger than expected loss in the fourth quarter and weakness at its investment bank overshadowed the first annual profit in four years for Deutsche Bank. Germany's largest lender has been trying to turn itself around under a new leadership, but has faced a series of hurdles, including allegations of money laundering, ratings downgrades and failed stress tests. Deutsche Bank has also become the subject of rampant merger speculation, and today's earnings figures underscore that the company still has a long way ahead to post a sustainable profit. Time is running out for the bank to turn around on its own, making a merger with rival Commerzbank more likely, two people with knowledge of the matter said this week. The bank's results were a mixed bag, with Deutsche posting a full-year profit of €341m, compared with a net loss of €735m in 2017. "Our return to profitability shows that Deutsche Bank is on the right track," said chief executive Christian Sewing, who took over last April and has embarked on plans to cut more than 7,000 jobs in an overhaul of the bank. On the downside, the fourth-quarter net loss of €409m was greater than the €268m expected on average by analysts, according to a consensus report on the bank's website. The quarter was marked by continued weakness in the bank's key trading business. Revenue at its cash-cow bond-trading division plunged 23%. For the investment bank as a whole, revenue dropped 5% in the fourth quarter. Executives said that negative headlines about police raids on the bank in November dented business. Sewing, in a call with analysts when asked about merger speculation, said the bank was focused on executing its plan and that he had a "lot of confidence" to execute on its plan in 2019. "I do not feel that. And there is no intervention either," he was quoted as saying by German broadcaster n-tv. Speculation of a merger has heightened under the tenure of Finance Minister Olaf Scholz, who has spoken in favour of strong banks. His team has met frequently with executives of Deutsche, Commerzbank and major shareholders. 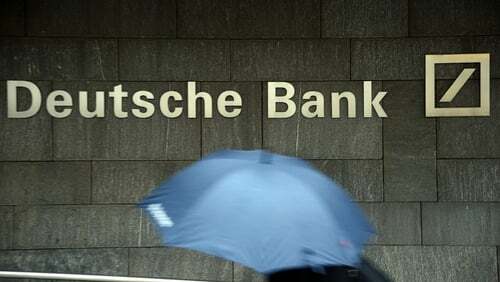 But the German lender has been plagued by losses and a scandal. A $7.2 billion US fine in 2017 for its role in the mortgage market crisis was a major blow that spooked clients and concerned regulators. The European Central Bank has set conditions for a possible merger between Deutsche and Commerzbank, Sueddeutsche Zeitung reported today, citing banking supervision sources.